The deRosiers are in party planning mode! Trevor's 6th birthday is coming up in early June. He's chosen a Lego theme, which means he and I have been busy sketching possible Lego cake designs, planning Lego games and activities, and brainstorming ideas for Lego decorations. And after last year's (infamous) zebra pinata, he definitely wants a Lego pinata. I have no idea how we will accomplish this, but no matter. We have seven-ish weeks. We'll figure it out. Each year we do two parties. The first is a backyard BBQ on a weekend close to his birthday. We invite Trevor's grandparents, aunts, uncles, cousins, godparents, and best friend- about 20 people. The second party, on his actual birthday, is a smaller gathering for a few friends. We use the same theme for both parties. We just finished the invitations for his family BBQ. We'll alter it slightly for the party with his friends. This was the first time that I've done an entirely digital invitation. 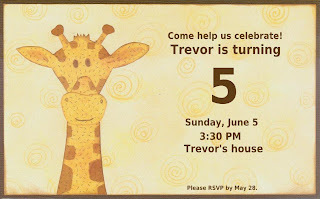 I thought it would be fun to look back on the invitations for Trevor's first five birthday parties. Here's the invitation I made for his 1st birthday party. Trevor's aunt didn't understand why the invitation had a hole in it. I thought everyone knew the story of The Very Hungry Caterpillar, but apparently not! As you can see, I printed the information, backed it with cardstock, punched a hole, added a sticker, and added a ribbon. It was an easy design to reproduce. I sized the invitation to fit in a standard envelope, so it didn't take long at all to get them in the mail. For Trevor's 2nd birthday, I fussy-cut a picture of him in Cookie Monster jammies, then used a circle punch to create a cookie from the patterned paper. Then I cut out the bite marks. I wrote out the party information on the tan cardstock and backed it with turquoise cardstock. 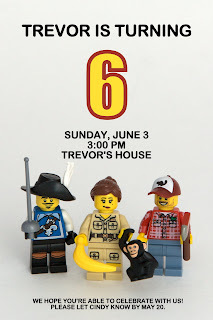 Because I had no interest in making a dozen fussy-cut Trevors, I scanned the invitation and emailed it to everyone. This worked so well (and saved both time and money) that I haven't mailed invitations since. 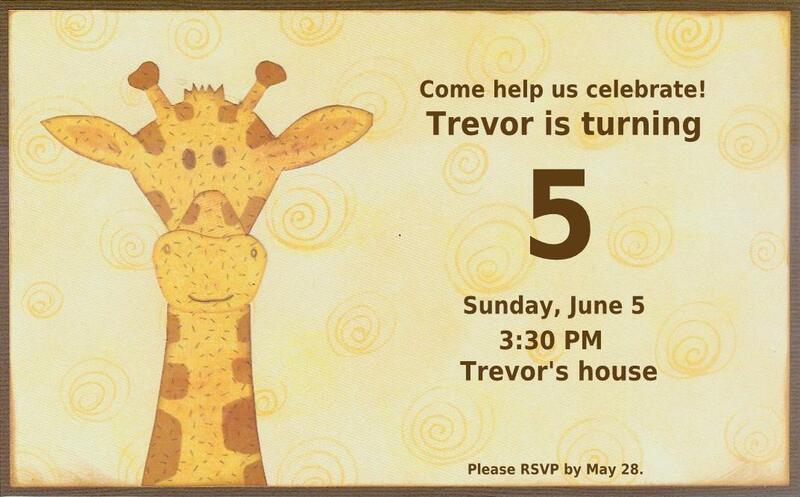 Here's Trevor's 3rd invitation. I typed the information, then added the clip art of Mike and Sully. I printed that, then backed it with cardstock. Then I scanned the invitation and emailed it. Trevor had a maze party for his 4th birthday. This was the most difficult and time-consuming invitation to make, as he wanted it to have a solvable maze, plus it needed to have the party information. Once I got the base done and printed, I topped it with cardstock frosting and candles. Then I scanned and emailed. Here's the layout from the family BBQ for Trevor's 5th birthday. I made a paper piecing of the giraffe on the yellow patterned paper, backed it with cardstock, then scanned that in and added the text digitally. How awesome!! I love love love all the lo's you have made for his birthdays!!! great collections of memories as he's aged. great post Cindy! I just love your style of scrapping....wish I could play with you. Take care.